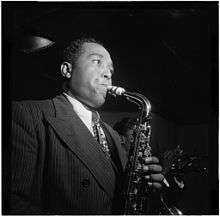 Charles "Charlie" Parker, Jr. (August 29, 1920 – March 12, 1955), also known as Yardbird and Bird, was an American jazz saxophonist and composer. Parker was a highly influential jazz soloist and a leading figure in the development of bebop, a form of jazz characterized by fast tempos, virtuosic technique and advanced harmonies. Parker was a blazingly fast virtuoso, and he introduced revolutionary harmonic ideas including rapid passing chords, new variants of altered chords, and chord substitutions. His tone ranged from clean and penetrating to sweet and somber. Parker acquired the nickname "Yardbird" early in his career. This, and the shortened form "Bird", continued to be used for the rest of his life, inspiring the titles of a number of Parker compositions, such as "Yardbird Suite", "Ornithology", "Bird Gets the Worm", and "Bird of Paradise". Parker was an icon for the hipster subculture and later the Beat Generation, personifying the jazz musician as an uncompromising artist and intellectual rather than just an entertainer. 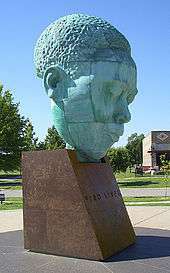 Charles Parker, Jr. was born in Kansas City, Kansas, and raised in Kansas City, Missouri, the only child of Adelaide "Addie" (Bailey) and Charles Parker. He attended Lincoln High School in September 1934, but withdrew in December 1935, just before joining the local musicians' union. In the late 1930s Parker began to practice diligently. During this period he mastered improvisation and developed some of the ideas that led to bebop. In an interview with Paul Desmond, he said that he spent three to four years practicing up to 15 hours a day. In 1937, Parker played at a jam session at the Reno Club in Kansas City. His attempt to improvise failed when he lost track of the chord changes. This prompted Jo Jones, the drummer for Count Basie's Orchestra, to contemptuously throw a cymbal at his feet as a signal to leave the stage. However, rather than discouraging Parker, the incident caused him to vow to practice harder, and turned out to be a seminal moment in the young musician's career when he returned as a new man a year later. In 1938 Parker joined pianist Jay McShann's territory band. The band toured nightclubs and other venues of the southwest, as well as Chicago and New York City. Parker made his professional recording debut with McShann's band. As a teenager, Parker developed a morphine addiction while hospitalized after an automobile accident, and subsequently became addicted to heroin. He continued using heroin throughout his life, and it ultimately contributed to his death. In 1942 Parker left McShann's band and played for one year with Earl Hines, whose band included Dizzy Gillespie, who later played with Parker as a duo. This period is virtually undocumented, due to the strike of 1942–1943 by the American Federation of Musicians, during which time few professional recordings were made. Parker joined a group of young musicians, and played in after-hours clubs in Harlem, such as Clark Monroe's Uptown House and Minton's Playhouse. These young iconoclasts included Gillespie, pianist Thelonious Monk, guitarist Charlie Christian, and drummer Kenny Clarke. The beboppers' attitude was summed up in a famous quotation attributed to Monk by Mary Lou Williams: "We wanted a music that they couldn't play" – "they" referring to white bandleaders who had usurped and profited from swing music. The group played in venues on 52nd Street, including Three Deuces and the Onyx. While in New York City, Parker studied with his music teacher, Maury Deutsch. On November 26, 1945, Parker led a record date for the Savoy label, marketed as the "greatest Jazz session ever." 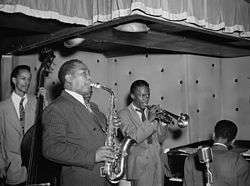 Recording as Charlie Parker's Reboppers, Parker enlisted such sidemen as Gillespie and Miles Davis on trumpet, Curly Russell on bass and Roach on drums. The tracks recorded during this session include "Ko-Ko", "Billie's Bounce" and "Now's the Time". Parker's addiction to heroin caused him to miss performances and be considered unemployable. He frequently resorted to busking, receiving loans from fellow musicians and admirers, and pawning his saxophones for drug money. Heroin use was rampant in the jazz scene, and users could acquire it with little difficulty. Parker wished never to return to Kansas City, even in death. He had told Chan that he wanted to be buried in New York, the city he considered his home. Dizzy Gillespie paid for the funeral arrangements and organized a lying-in-state, a Harlem procession officiated by Congressman and Reverend Adam Clayton Powell, Jr., as well as a memorial concert. Parker's body was flown back to Missouri, in accordance with his mother's wishes. Parker's widow criticized the dead man's family for giving him a Christian funeral even though they knew he was a confirmed atheist. Parker was buried at Lincoln Cemetery in Missouri, in a hamlet known as Blue Summit, located close to I-435 and East Truman Road. Other well-known Parker compositions include "Ah-Leu-Cha", "Anthropology", co-written with Gillespie, "Confirmation", "Constellation", "Donna Lee", "Moose the Mooche", "Scrapple from the Apple" and "Yardbird Suite", the vocal version of which is called "What Price Love", with lyrics by Parker. .
Street musician Moondog wrote his famous "Bird's Lament" in his memory; published on the 1969 album Moondog. The avant-garde trombonist George Lewis recorded Homage to Charles Parker (1979). 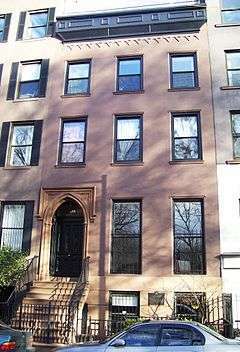 From 1950 to 1954, Parker and his common-law wife, Chan Berg, lived in the ground floor of the townhouse at 151 Avenue B, across from Tompkins Square Park in Manhattan's East Village. The Gothic Revival building, which was built about 1849, was added to the National Register of Historic Places in 1994, and was designated a New York City landmark in 1999. Avenue B between East 7th and East 10th Streets was given the honorary designation Charlie Parker Place in 1992. The Charlie Parker Jazz Festival is a free two-day music festival that takes place every summer on the last weekend of August in Manhattan, New York City, at Marcus Garvey Park in Harlem and Tompkins Square Park in the Lower East Side, sponsored by the non-profit organization City Parks Foundation. The festival marked its 17th anniversary in 2009. In one of his most famous short story collections, Las armas secretas (The Secret Weapons), Julio Cortázar dedicated "El perseguidor" ("The Pursuer") to the memory of Charlie Parker. This piece examines the last days of Johnny, a drug-addict saxophonist, through the eyes of Bruno, his biographer. Some qualify this story as one of Cortázar's masterpieces in the genre. Jean-Michel Basquiat created many pieces to honour Charlie Parker, including Charles the First, CPRKR, Bird on Money, and Discography I. The 2014 film Whiplash repeatedly makes reference to the 1937 incident at the Reno Cafe, changing the aim point of the cymbals to his head and pointing to it as proof that true genius is not born but made by relentless practice and pitiless peers. ↑ "Charlie Parker Biography – Facts, Birthday, Life Story". Biography.com. Retrieved February 17, 2014. ↑ "Charlie Parker". The New Grove Dictionary of Jazz. Retrieved April 23, 2012. ↑ "Yardbird". Birdlives.co.uk. Retrieved December 19, 2013. ↑ The 1959 Beat parody album How to Speak Hip lists the three top most "uncool" actions (both in the audio and in the liner notes) as follows: "It is uncool to claim that you used to room with Bird. It is uncool to claim that you have Bird's axe. It is even less cool to ask 'Who is Bird?'" ↑ "Paul Desmond interviews Charlie Parker". puredesmond.ca. Archived from the original on July 6, 2011. Retrieved March 1, 2011. ↑ Woideck, Carl (October 1998). Charlie Parker: His Music and Life. Michigan American Music Series. University of Michigan Press. p. 18. ISBN 978-0-472-08555-2. ↑ "pbs.org". pbs.org. Retrieved March 10, 2011. ↑ amb.cult.bg Archived December 21, 2007, at the Wayback Machine. ↑ See Jazz, Episode 7: "Dedicated to Chaos: 1940–1945". ↑ Blakely, Johanna (April 2010). Lessons from Fashion's Free Culture (TEDxUSC 2010). TEDTalks. Retrieved December 3, 2010. ↑ Reisner, Robert, ed. (1977). 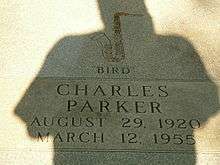 Bird: the Legend of Charlie Parker. New York: Da Capo Press. p. 133. ↑ Charles Baird Parker 61 Son of Jazz Great. Philly.com. Retrieved June 29, 2016. ↑ "Ken Burns interviews Chan Parker" (PDF). Retrieved March 10, 2011. ↑ Ross Russell (1996). Bird Lives! : The High Life And Hard Times of Charlie (yardbird) Parker. Da Capo Press. p. 361. ISBN 9780306806797. A confirmed atheist, he had not been inside a church in years. ↑ Griffin, Farah Jasmine; Washington, Salim (2008). Clawing at the Limits of Cool: Miles Davis, John Coltrane, and the Greatest Jazz Collaboration Ever. New York: Thomas Dunne Books. p. 237. ↑ Grammy Awards search engine Archived August 28, 2015, at the Wayback Machine. ↑ Richard Tucker. "Charlie Parker: 32 cents Commemorative stamp". Esperstamps.org. Retrieved March 10, 2011. ↑ Yanow, Scott. "Joe Pass: I Remember Charlie Parker". AllMusic.com. Retrieved July 1, 2016. ↑ "Charlie Parker: The Charlie Parker Residence, NYC". Charlieparkerresidence.net. Retrieved March 10, 2011. ↑ Archived February 9, 2012, at the Wayback Machine.